Love Books. for the Kiddos. | The House of Martins The House of Martins: Love Books. for the Kiddos. Love Books. for the Kiddos. With Valentine's Day coming up - I'm starting to get some love/valentine's day themed books from the library to help set the mood around our house. And to spread the love, of course. XO, OX: A Love Story: An Ox falls in love with a Gazelle. And you can watch it all unfold. Love: The newest book from Matt de la Peña - a deep and true book about love and all its forms and magic. Totally worth a read. Groundhug Day: This is a clever book that combines Groundhogs Day and Valentine's Day (and then throws in a little St. Patty's and Easter at the end. Lucille loves holidays so this was a favorite when we borrowed it from the Library. Love Monster: I love all Rachel Bright books and this one is especially cute. We've had this one forever and the kids both love it. Snuggle Puppy! : I read this book to the kids SO MUCH when they were babies. I could still recite the whole thing, by heart, even though I haven't read it in at least a year. This would make a great gift for a new baby. The I LOVE YOU Book: Another book my kids have loved since forever. They even use the lines from the book to me sometimes. A good reminder to kids that even if things aren't perfect - they are still loved. The Unexpected Love Story of Alfred Fiddleduckling: Another library book that was a big hit. My favorite part about reading this to the kids was that they wanted to draw another page to the book to really show off the ending. Make sure you follow me on Instagram because I'll be posting the picture they draw there. Stay tuned. 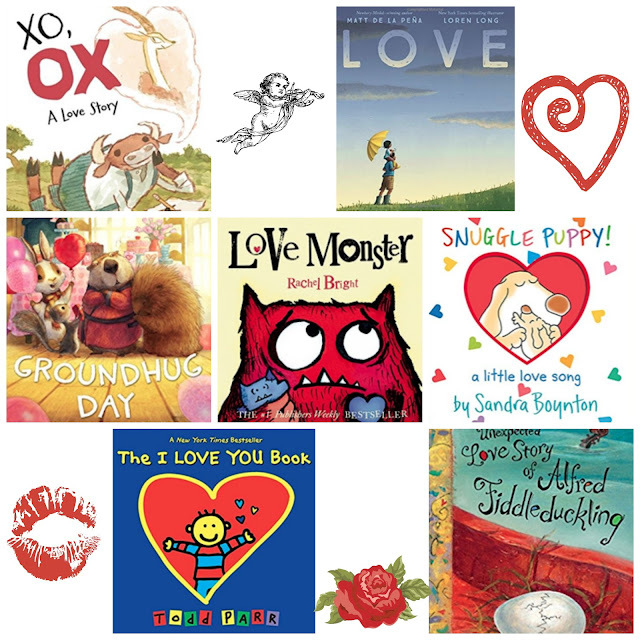 Do you or your kids have a favorite love, valentine's day themed book not mentioned above? Share it in the comments!